It is very hard to prevent armadillos from using a particular area. There is no magic repellent or sound machine that will keep them at bay. They don't even seem to care about big scary dogs. The best armadillo prevention technique is actually strudy fencing, which goes down at least a foot into the ground, around the perimeter of the property. They'll easily dig under fencing that merely touches the ground. Digging one or more large burrows on the property, including next to houses, or under concrete walks or foundations, which can undermine the structure. Digging many holes throughout the lawn, in their search for earthworms and grubs. That's about it. They are generally harmless and docile animals, they are not very intelligent, and they sleep about 20 hours per day. If not for their digging and burrowing habits, they would not at all come into conflict with people. Still, if you don't want the digging, we can remove them for you. How to keep armadillos away from the lawn - There are many nuisance animals that burrow and create tunnels in a yard. Armadillos are usually an unexpected guest. They are usually nomadic, and will wander through a yard without setting up permanent residence. When they do decide to stay, it’s usually because the abundance of food is too much to resist. It is very hard to prevent armadillos. The best armadillo prevention technique is actually good fencing, which goes down into the ground, around the perimeter of the property. The only effective way to get rid of armadillos in the lawn is to trap and relocate them. There is no poison for an armadillo, and these quiet creatures are handled easily enough that lethal measures are not necessary. Trapping an armadillo can be tricky, though. They do not respond to baited traps, so any cage trap must be strategically set along the animal’s regular path of travel. 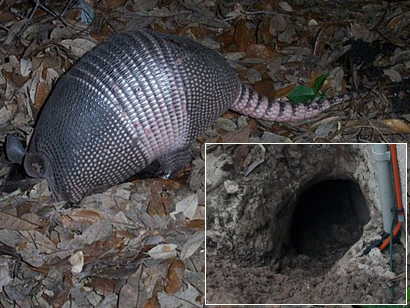 Because armadillos have a series of tunnels and escape routes, employing the use of a short, temporary fence can help guide them into the trap. Make sure the cage trap is on level ground so instability doesn’t frighten the armadillo away. Do not bait the trap. Bait only draws in other wild animals, not armadillos. Once you have captured your quarry, transport it to a safe location and release it. How to keep armadillos away from your property - There is no way to rid the outside world of armadillos. If you live in a region prone to these nuisance animals, the best thing you can do for your yard is fence it in. This fence can’t just be above ground. Armadillos are fantastic burrowers, so any installed fence must extend underground at a slight angle. If fencing in your property isn’t reasonable, proper landscape care will be an important part of being armadillo-free. By eliminating areas of excessive moisture from your property, you are decreasing the chances of grubs and worms overpopulating. Without an ample food source, any armadillo that wanders through won’t be inclined to stay. If you do have an armadillo outside, you can attempt to trap it with the use of a live, cage trap. Place the trap outside near any active burrows or trails. Ideally, fencing in the burrow area with temporary fence will help steer the armadillo into the trap. Baited traps do not work well for armadillos, so location is the key factor. Once you’ve snagged your nuisance animal, relocate it in an area away from your neighborhood. How to keep away armadillos in the yard - Getting rid of these pesky hard shell animals is rather difficult. They have large claws and strong legs for digging termite mounds. Traps are one way to get rid of the armadillo; however, make sure you call the Humane Society or other authorities to find out about local wildlife trapping laws before you start. Make sure if you plan to release them after capture yourself, you do this far from the home. Try to release them near a body of water, a lake, pond etc. These guys can really tear up a yard and leave large holes for owners to deal with. Fences may keep them out for a while, but remember armadillos are excellent diggers. They will eventually bypass the fence and get to the yard. They are very territorial animals and do not give up easy on their spot. These creatures have very sensitive noses. Anything with a strong noxious odor tends to steer them away. It has been known that these guys do not like the smell of pine. Pine mulch could be a help around the perimeter of the yard, near flower beds and around your fence. Then there is always the nice old mothball fix or ammonia. It is important to be cautious using these household items. If you have you children in the yard make sure they do not get into either the mothballs or ammonia, and your pets and other non-targeted animals may be affected as well. How to keep armadillos away from the house - Remember if you want to get rid of an armadillo that has entered into your house by trapping it; call the local Humane Society first. Ask about local trapping laws. If you plan to trap this animal in your garage on your own and need bait, worms work great. Wrap the worms in a nylon stocking and set your trap. Always wear gloves to protect yourself when handling a trapped armadillo. Are you ready to release him? Keep in mind they are territorial so they will not quietly leave your garage. Release them near a body of water such as lake or pond. They tend to make new burrows closer to water. Once you are sure you have removed the little creature try placing a few moth balls or some pine scented oils strong enough to smell the entire garage and he will more than likely keep away. With their strong sense of smell and hate for the smell of pine and moth balls this may work. However, catch and release is the best method for keeping the armadillo away and helping it to survive elsewhere.